For many organizations, 2014 will be the year they implement DCIM. This practical white paper will also ensure that 2014 is the year they realize their return on investment from DCIM. 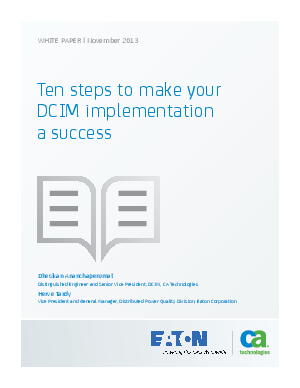 ning business needs and setting operational thresholds to enabling integrations and ensuring scalability, we have taken the combined expertise of CA Technologies and Eaton, based on lessons learned from our customers, to provide this best practice implementation guide to DCIM.